A trip to India isn't exactly complete without getting in a rickshaw now is it? Katy Perry hopped on with Priyanka Chopra for what I am sure was quite a ride. Priyanka Chopra loves wearing short dresses in solids and I love her choice of dresses. 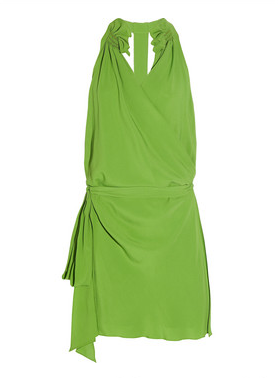 :-) Seen here in a bright grass-green crepe de chine draped Vanessa Bruno dress. Its nice that Priyanka tied her hair up to shoe the ruffled detailing of the dress - very pretty. Katy Perry seems to be doing a fine job of making everything work with her blue hair. Really like her floral print dress and especially the Hermes leather bracelet. You can shop for Vanessa Bruno goodies at Le Mill in Mumbai.